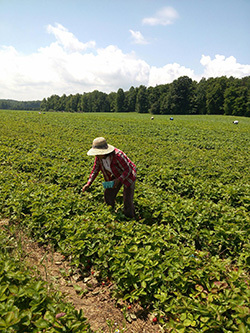 This is the first in a two part series on protections for farmworkers from pesticides. Read part two, Farmworker Mother To EPA: We Deserve Protections, and the accompanying special feature, Pesticides: The Workplace Hazard The EPA Is Ignoring. If the apples in your local store are bug-free because of pesticides, then you might ask who the pesticides hurt before the apples left the farm. That’s because many pesticides are toxic enough to seriously harm the humans who work in the orchards. A growing number of Americans recognize the hazards of toxic chemicals and as a result have reduced their consumption of produce grown with pesticides to protect their family’s health. But while U.S. consumers are finding ways to protect themselves, far too little is being done to protect farmworkers, who are on the frontlines of exposure to high levels of toxic pesticides. To address this urgent need, this week farmworkers from across the nation are meeting in Washington, D.C. with their members of Congress to call for stronger protections from hazardous pesticides. These farmworkers and their allies seek to strengthen the Worker Protection Standard under the Federal Insecticide, Fungicide, and Rodenticide Act, a set of outdated safeguards the Environmental Protection Agency has failed to revise for more than 20 years despite overwhelming evidence of their inadequacy. “If policy makers truly listened to the stories of what is going on, laws would change,” said Mily Treviño-Sauceda, a former farmworker who founded a women’s farmworker group in California and is president of the National Farmworker Women’s Alliance. She added that if farmworkers aren’t protected from pesticide exposure, neither are their communities, their school-aged children, nor the food our plates. There are an estimated 5.1 billion pounds of pesticides applied to crops annually in the United States, and thousands of farmworkers each year experience pesticide poisoning. It is well-documented that a significant number of the nation’s estimated 1–2 million farmworkers and their families are exposed to toxic pesticides. These exposures result in serious short and long-term health impacts, including stinging eyes, rashes, blisters, nausea, headaches and even death. Long-term impacts include delayed and include infertility, birth defects, endocrine disruption, neurological disorders and cancer.